Augmented Reality (AR) is now a viable sales tool for businesses with incredible potential. 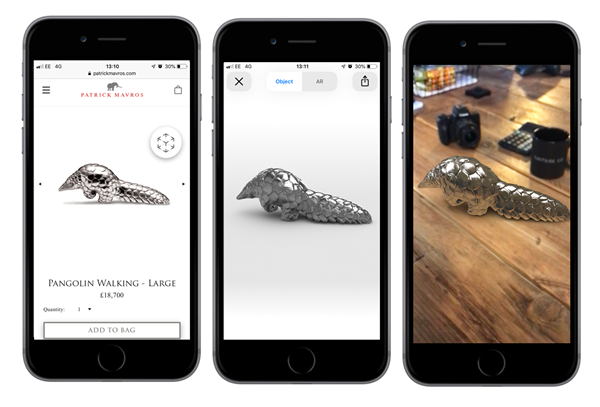 We take a look at Shopify’s new AR functionality, and how augmented reality is set to change ecommerce. Augmented Reality (AR) has been around for a few years now, but the rate at which it’s transformed from making us look like animated zombies into a viable tool for business has been phenomenal. We take a look at Shopify’s new AR functionality, and how augmented reality is set to change ecommerce. Augmented reality (just like the Pokemon Go! app) is the integration of digital elements within the user’s real-world environment through a compatible device, usually a smartphone. It places digital assets, imagery and information into the user’s field of vision to provide an enhanced - or augmented - view of the real world. It allows the user to move around the digital object and see a full 360 degree view, as well as zooming in to see the details, and zooming out to see how it fits into the wider environment. It requires 3D modelling of objects so that customers can rotate things 360 degrees in all directions, and is becoming more frequently used on ecommerce stores. Having the 3D product model then opens up the AR opportunity - using mobile technology (camera and software) to take that 3D object and place it in the customer’s current environment. It effectively gives online shoppers a chance to “try before you buy”. Eastside Co has created an augmented reality feature for one of its latest website launches which enables visitors to not only view one of their show-stopping products in 3D, but also position it in their own environment. Visitors to the site can see the flat images they would normally expect. By clicking the 3D button at the top of the image they can switch to an interactive view which allows them to rotate a 3D model of the Pangolin and zoom in and out with the usual haptic gestures. With the right device, users can then take it one step further by switching to AR mode and place the Pangolin in their own real-world environment, rotating, zooming and positioning the object wherever they way to. Please note that no virtual pangolins were harmed during the making of this blog. Got an iOS 12 device? Check out the Pangolin on Patrick Mavros here. Not got iOS 12? Take a look at our video and see the AR in action. While some ecommerce sites have separate AR apps which need to be downloaded from the App Store (for example 'Ikea Place'), Shopify’s AR feature can be built into the merchant’s store so users can view AR items without interrupting their purchase journey. What are its applications in ecommerce? The technology has developed rapidly to provide high quality digital interactions, which means not only a better experience for users through their mobile devices, but also a better tool for brands wanting to integrate this technology into their ecommerce strategies. And, with mobile devices overtaking desktops for web browsing and online shopping, there is clearly a means for this technology to become part of a fully integrated ecommerce strategy in the not so distant future. 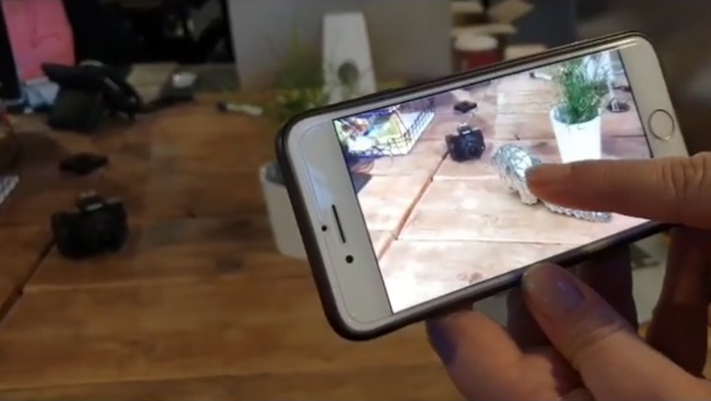 There are already some great examples of AR in ecommerce and, with Shopify now supporting AR on iOS devices, the opportunity to exploit the technology is even greater. How will it enhance customer experience? There are still various barriers to online sales, depending on the product range a merchant is selling. A common objection is that with bricks-and-mortar stores, customers can physically interact with products before they buy. While customers can see flat images of the product and read descriptions and technical specifications on an ecommerce website, they can’t pick the product up or see it in their real world. With AR, merchants can provide additional information, allowing the customer to get a closer look at the product from all angles. Customers can also place objects in the environments in which they’ll be used, for example positioning a vase on a coffee table or a lamp in the corner of a room, and can see whether the object fits their space or suits their decor. Furniture - will it fit in your room, match your decor, go with other key pieces? Decor - will it sit well on your sideboard? Will it take up too much room on your wall? Beauty - upload a photograph and apply virtual products to see which hair colour, lipstick or foundation suits you. Fashion - what are the soles on the shoes like? Does that trim run all around the garment? Manuals - bring your user guides to life with 3D walkthroughs, instructions and demos. As with any new technology, the impact of Augmented reality in ecommerce will be determined by user demand. And with users likely to embrace this technology, it will be the ecommerce retailers who can meet this demand who will lead the way. See products at full size in situ, walk around it, and get up close to see the details. What are the benefits to merchants? Not only does it help customers choose the right product and get them emotionally connected with their potential purchase through enhanced visualisation, it also helps merchants through reduced returns because items don’t look or don’t fit as expected. As we said above, Shopify’s AR feature is currently only available on iOS 12 devices, and we’d love to see it come to Android as soon as possible. Want to get AR on your store? Get in touch to find out more about enhancing your customers’ experience and showcasing your products.